Whitbyhotels - hotels in Whitby North Yorkshire - Panoramic sea-views from Whitby Abbey to Sandsend, 18 en-suite bedrooms, an in-house Restaurant, a licensed Bar and a comfortable sea-view Lounge. The Seacliffe Hotel is a popular choice for visitors to Whitby. Private parking for up to eight cars, plus on-street parking, is available. A wide choice of freshly cooked breakfasts awaits you each morning: a Full-English breakfast, or a Vegetarian option, or perhaps Kippers, Porridge or Scrambled Egg with Smoked Salmon. An extensive menu of 2 or 3 course meals, accompanied by an excellent wine list, is served each evening, in the Restaurant. However, please book in advance to avoid disappointment, since places are limited! Please view our website and browse our sample Restaurant & Bar Meal menus. 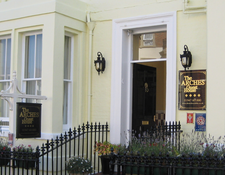 Whitby guesthouses - Guest House in Whitby North Yorkshire - The Arches guest house in Whitby is a 4 star awarded guest house accommodation, offering very high standards of comfort and cleanliness with excellent breakfasts, coupled with a warm, friendly family atmosphere. 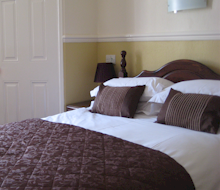 Sited on Whitby's popular West Cliff where the majority of the hotels, guesthouses and bed & breakfasts are established. The Arches is close to the West Cliff leisure centre, swimming / paddling pool, the Whitby Spa Pavilion Theatre and sandy beaches. The town centre is just a few minutes walk from the Arches guesthouse, so take that leisurely stroll along the cliff tops, down through ancient cobbled stone streets of Whitby, enjoying the sea and harbour views on your way. For more information on what we can offer you please visit our website listed above.